If you are thinking about buying a ductless or mini split unit for your house, then you should look at these ideas when selecting your split heat pump system. When anyone first starts talking about heat pumps, ductwork and air handlers, if you are like most people, your eyes begin to glaze over and the surrounding sounds start to fade into the background…boring! But hang on and pay attention for a second. A mini split system or a split heat pump make great add-ons for all kinds of “ductless” heating sources like a heated water or hydronic system, radiant wall or floor panels and old fashioned wood stoves or kerosene space heaters. And a split system heat pump is a cheap choice good choice for those new room additions or if you live in an older house that hasn’t been retrofitted with central heating and cooling ducts. 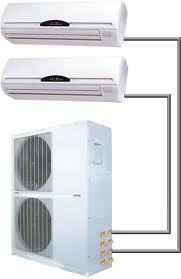 Or you have has a room that is always freezing cold or broiling hot, where a mini split unit can be your best solution. 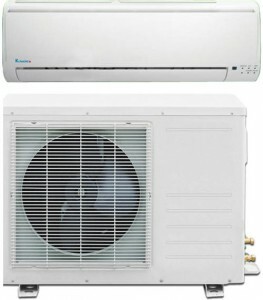 A split heat pump is similar to an ordinary air source heat pump. 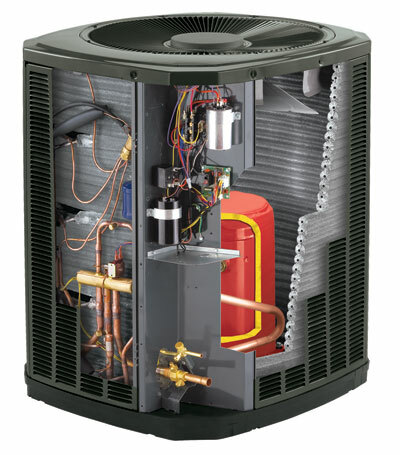 It has two major parts: a compressor-condenser (in an outdoor unit) and air handler (in an inside unit). A jacketed pipeline or conduit connects the two units with using refrigerant lines, power cables and a condensation drainage tubes. The advantage of a split heat pump is their compact size. The outside unit has a much smaller footprint than a traditional heat pump and some models are so small that they can be easily mounted on a window ledge or roof overhang. Another advantage is that most outside compressor-condensers can handle as many as four interior air handler units. 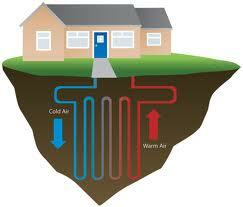 This means you can heat or cool as many as different 4 rooms or zones (in a larger space) with a single outside unit. Plus each inside zone can be controlled using its own thermostat, which allows you to save a bunch of money on energy bills by not wasting heat or cooling in rooms where it’s not needed. Another way that split system heat pump systems puts money in your pocket is that without any forced air ducts, these units can prevent energy losses from air escaping through holes, gaps or cracks in the ductwork. It’s been estimated that as much as 30% of your energy bill is used to heat or cool air that is lost through leaky air ducts. Plus when it comes to the appearance and comfort of your home, a mini split system offers the most and best interior design options. The interior air handling units are typically very small and can be mounted on just about any wall, suspended from the ceiling or mounted flush inside a drop or false ceiling. Or you can buy a standalone floor model as well, so it can be tucked in an out-of-the-way corner. These inside units are only about 7-8 inches deep and 2-3 feet long and come housed in smooth, modern-looking metal cabinets that fix in most home decors without being noticeable. And as mentioned before, they come with remote thermostats that can be used to adjust the temperature settings for each one and turn the unit on and off, no matter where it’s mounted. Granted a split heat system may not be for every homeowner but in those situations where it is good fit, a split heat pump can be a great addition to your home. Previous Article Is a 3 Ton Heat Pump Big Enough?